This evening I captured and released a spider species that was in my kitchen. I am unsure as to identification and would appreciate any assistance. My immediate thoughts were that this might be Dysdera crocata as we have had these before. However, it appeared slimmer, relatively fast (it was very alert to movement and subsequently difficult to catch) and while it had red legs (slim and long, front two very forward facing at rest), the abdomen was black and white striped (?) though difficult to make out exact pattern. The abdomen was not discernably 'pea shaped' or prominent in any way. Size/span was about 4cm in total. Cephalothorax was red/brown. Could this be one of the Steatoda? I am more a bird ID man, so this is not a field that I have any real experience in. I look forward to hearing your thoughts. Thanks in advance and hope you enjoy your weekends. Any reflex responses for a guide towards ID on this small (3-4mm) spider beaten from heather in a woodland ride today which I omitted to collect. Getting back to a previous post, specifically the one regarding Microlinyphia pusilla. 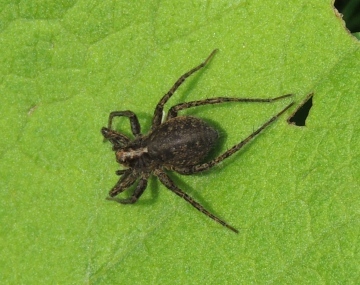 Going by this website, there are only the two Microlinyphia species recorded in Britain (M. pusilla and M. impigra) and I have done a little research on the web about these two species. 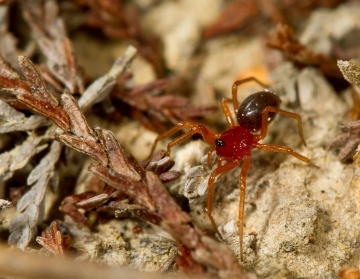 Now, I'm assuming that my specimen is a female, but my query relates to the fact that each photograph of M. impigra appears to show the species as paler and with a noticeable thoracic stripe when compared with M. pusilla. You state that to get a positive ID, the genitalia need examining, and I'm more than happy to accept this, but this does beg the question - should this thoracic stripe be ignored completely in identifying between these two species? Or is there another confusion species that would merit the gen det? Just about the only eggsac which could conceivably be identified to species level is the sputnik shaped one of Paidiuscura pallens, on oak leaves. Many thanks again, Peter. I haven't got any literature as yet, so these will help in trying to assign future specimens to at least family level. On reading the species information for these four, but especially Zygiella x-notata, it mentions egg sacs. Perhaps this is a daft question, but can egg sacs be reliably identified to species level? 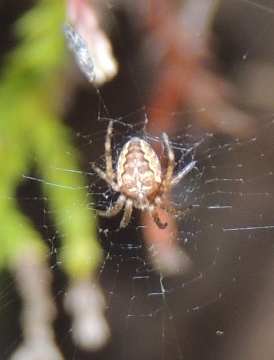 The first photo is indeed Araneus diadematus. The second is certainly not a Tegenaria species but I can't see enough (in particular the top of the spider) to make any sensible informed suggestion, other than a guess that from the palps it looks as though it might be an adult male and that a freshly moulted Zygiella x-notata might be possible - but this is guess at best. The third is a Pardosa wolf spider, probably juvenile at this time of year, so not reliably identifiable to species anyway, but possibly Pardosa amentata. The fourth looks to me like Microlinyphia pusilla, but again to be sure one needs to examine adult genitalia under a microscope. I have some more for ID, some I'm struggling to assign to a family. The first (c3mm) I'm assuming is a very young Araneus diadematus. This was found on 11 Aug 2012 at NS211595 in Largs, Ayrshire (VC75) and can be found below. The next was also found NS211595 in Largs, Ayrshire (VC75), this time in the house and on 25 July 2012. I have a feeling it could be one of the Tegenaria species and probably can't be identified from the photo. The third was found at NS366264 at Shawfarm Industrial Estate, Prestwick, Ayrshire (VC75) on 5 July 2012. And finally the last that was again at Shawfarm Industrial Estate, Prestwick, Ayrshire (VC75) but this time at NS367264 and on 13 July 2012. Any help on these would be gratefully appreciated. You either have to get a picture or send a spider to get an identification on this, details below. I wonder if anyone could please help. I cleaned out a garage in Stroud this weekend and came across a large number of spiders which I have not seen before. They were about 10mm in length, gloss black with a number of bright purple spots on their backs. 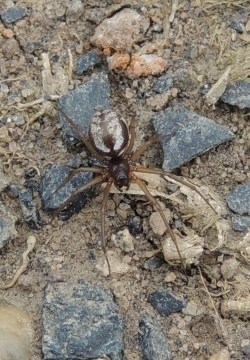 Unfortunately i did not have a camera, they appear to resemble a false widow or cave spider but the markings are completely different. 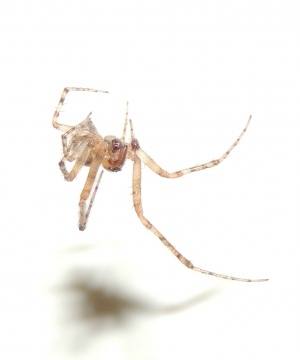 I live in Somerset and have a large number of false widows around my house and they do not seem to be the same. can anyone tell us what spider this is? 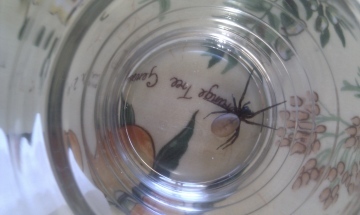 We found this just a moment ago on our sofa in the livingroom - can anyone tell us what spider this is?